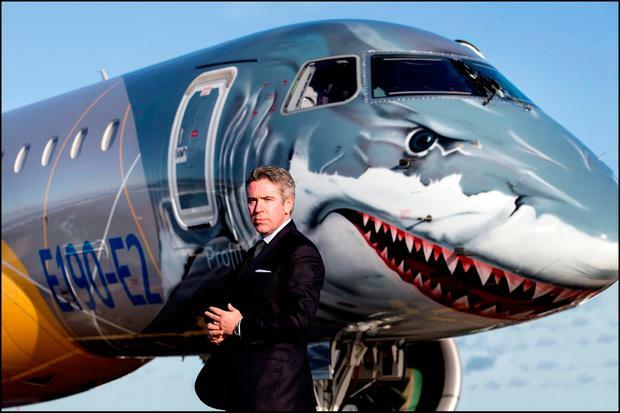 Slattery was in Dublin last Friday to conclude a 200-day 68-city world tour with Embraer's new super-efficient Embraer E190-E2 passenger jet, the development of which he has led from scratch for the last seven-and-a-half years. He and his management team are also on the cusp of brokering a historic joint-venture deal with Boeing that could see the US giant acquire a controlling 80pc stake of the 50-year-old Brazilian aircraft-maker's commercial aviation unit, valuing it at $4.75bn. But what exactly that mega deal - if approved by the Brazilian government - would mean for his own personal position as CEO of that unit and for his future career he just does not know. "Being at the table with a giant like Boeing on the other side negotiating with them to create a joint venture with your business is intellectually very satisfying. Trying to achieve that in a way that is best for everyone is unique and will be hard to top after this." "For sure, this is a moment of uncertainty," says Slattery, who nevertheless has strongly publicly backed the deal from an early stage. "The only thing you can be certain of is are you putting 100pc into everything you do everyday? If you do that you can go to sleep at night knowing 'I've done everything I could'. Clearly I am at a moment of inflection, for sure. But you either have a philosophy where you embrace change or you are scared of change." He expects that the deal could be closed and approved by the second half of next year. "I have been a strong proponent of the transaction since the get-go. I believe it will be very positive for Brazil, for the aeronautical industry. It will allow us to sell more aircraft as part of the bigger Boeing organisation. I believe we could potentially double our production." Slattery describes his pursuit of the Boeing deal as the biggest thing that has yet happened in his career. He does not yet know - and is not prepared to speculate - where the prospective deal will leave his own employment or career in a year's time. "Boeing will decide who the management team of the joint venture will be should it go through. I have not had that conversation with Boeing. We are still in - albeit the final stages - of negotiations so my fiduciary responsibilities are to ensure that the Embraer shareholders get the best transaction. As I sit here, personally it is an unusual moment in time because I am sponsoring the joint venture - but I can't speak for myself and where I will be after the joint venture gets set up. Right now I can't have that conversation legally." Ultimately, the management team of the new joint venture will be chosen by Boeing and whether they will back the current leadership or bring in their own people at the top remains to be seen. "I'm sure Boeing will make all the right decisions - they are expert at this - but I just cannot deal for myself. Below the office of chief executive it is clear to me that all of the organisation will be invited into the joint venture but I cannot have that conversation with them. I am comfortable that Boeing will make the right decision. What will be will be." So the joint venture - and his own wholehearted support of it - could ultimately do him out of a job just at the moment of culmination of the two big successes of his career to date - the launch of a brand new passenger jet and the sealing of a massive deal to sell Embraer's commercial aviation unit to its huge American competitor. "Yes that's technically possible. There is uncertainty because of my fiduciary responsibilities, but it is not something that leads to any sleepless nights. The best thing I can do right now is focus on filling out the backlog for the E2 and then we can worry about what the future holds." That firm's order backlog - a measure of expected revenue - stands at 250 E2 jets, worth about $13.5bn. The E-jet family in total just delivered its 1,500th aircraft last week. Those numbers for the third-biggest aviation manufacturer in the world will do Slattery's standing in the highly-competitive industry no harm at all and will mean that however the Boeing deal plays out, his phone is unlikely to stay silent. "What is important to me is to find an alignment of cultural values and I need to be part of a team that has fire in their belly. That probably comes from my mother and my father - great traditional values and super-strong work ethic that I see shared with my brother [Avolon CEO Domhnal Slattery]. Great values and a burning desire to win the marketplace defines Boeing, so if, at some point, that conversation were to materialise that would be a conversation of course I would entertain. But because I have robust values that is not a conversation I could entertain - or that they would want entertained - until after contracts are signed. And I don't know if they will want to entertain it even then. But I admire the Boeing company enormously and have done throughout my whole career." That admiration started he said, when he and Domhnal would go with their father from their home in Ennis, Co Clare to Shannon airport. "We'd see the Boeing 747-400s parked there before flying to JFK. Back then it was iconic." He began his career, like his brother, in the leasing business but indicates that he has no intention of returning to that industry and that he has never been happier than he has been working in aircraft manufacturing. "I have been bitten by the OEM [aircraft manufacturing industry] bug and it would sadden me to leave that world because I have found a niche where I feel fulfilled," he said. "My journey in aviation started in the mid-90s as a consultant and adviser to airlines. Then, of course, with the launch of RBS Aviation Capital and the growth of that I became a banker and lessor to airlines and now, for the last seven and a half years, I have been a manufacturer selling equipment to the airlines. Throughout that journey, there is no doubt in my mind that the intellectual rewards of being an OEM are very hard to beat. It is just a very special relationship with the airlines and it is very rewarding because we are talking to airlines constantly." Slattery says the business is highly competitive: "It is just like in boxing. There is no prize for second place. When we get into the ring we get in to win. The competition is vicious. We try not to make it personal but we are responsible for tens of thousands of jobs. That's why - with our support - Brazil opened a panel at the World Trade Organisation against Canada for what we believe were illegal subsidies to [Embraer competitor] Bombardier and the C-Series." Slattery was very public earlier in the year about his criticism of the Canadian government's support for Bombardier's C-Series jet, believing this amounted to unfair government subsidies and hit Embraer's own sales. "I just want a level playing field. We are not asking the Brazilian government to put equity into Embraer. We live or die on whether we are making aircraft sales profitably or not." Bombardier has since offloaded the C-Series project to Airbus and Slattery believes this marks its exit from commercial aviation. Last week Bombardier announced almost 500 job cuts at its Belfast plant, something that did not surprise Slattery: "When you sit in the seat I sit in you have to look through the global lens. The rules of war have been defined by the WTO." He insists that his loyalty in these matters has to be to his 18,000 colleagues in Brazil. "But if I was in Shorts I would be feeling very upset and very bitter and the UK government should be feeling very bitter about that situation. The view was that when the C-Series was part of Bombardier, these commitments were being made and investments were being made and jobs were being secured for the long run and now we find a situation where that is not manifesting. As an Irishman, when I saw that headline I felt sick to my stomach for those guys because it's not like this is a part of the world where it is easy to jump from such a highly specialised job. So, as an Irishman, I felt sick but I wasn't surprised." Whether or not, in time to come, Slattery will be required to transfer his own skills remains to be seen but, right now, he is taking huge pride in the E2 project. "This is the achievement of my career to date. I got to work with the team to develop the business case, present it to the board, get approval, develop the aircraft, get it certified and bring it into service. It has been a very special experience and a huge learning. I hope the future is full of challenges and excitement. Whatever it is I am up for the challenge." Martin O'Sullivan In recent years, we have seen a steady increase in the number of robotic milking systems amongst our dairy farmer clients. Some are new entrants, but many were existing operators who needed to upgrade their facilities and decided that robots were the way forward.